Make your journey more enjoyable without you having the stress of carrying your luggage. 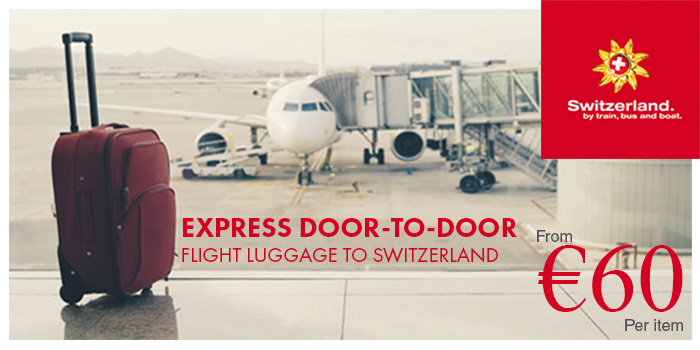 Express Door-to-Door Flight Luggage to Switzerland is a service that allows the customer to travel lite to Switzerland on any airline. Fly from any airport to Zurich or Geneva where your luggage will be transferred to your hotel at the destination designated on your tag. Express Door-to-Door Flight Luggage can be purchased up to 12 months in advance with a minimum of 4 days inadvance. The registered luggage is precisely defined by number of items and weight. Depending on the flight class booked, itranges from 23 to 32 kg. The flight to Switzerland must arrive by 11:30am local time for the passenger to use this service. Available with all airline carriers. If available, estimated luggage drop off and pickup time. 15% cancellation penalty applies to Express Door-to-Door Flight Luggage to Switzerland if cancelled 4 business daysor more in advance of departure to Europe. Cancellations made within 4 business days of departure to Europe arenon-refundable. Do you have a question or comment for us? or would you like to make a suggestion, voice a concern or share a compliment? Send us an email using our web form and we’ll get back to you as soon as possible.